« Perhaps Judith Collins’ mysterious Wikipedia chimney sweep is a shy hobbyist #WhoisClarke43? 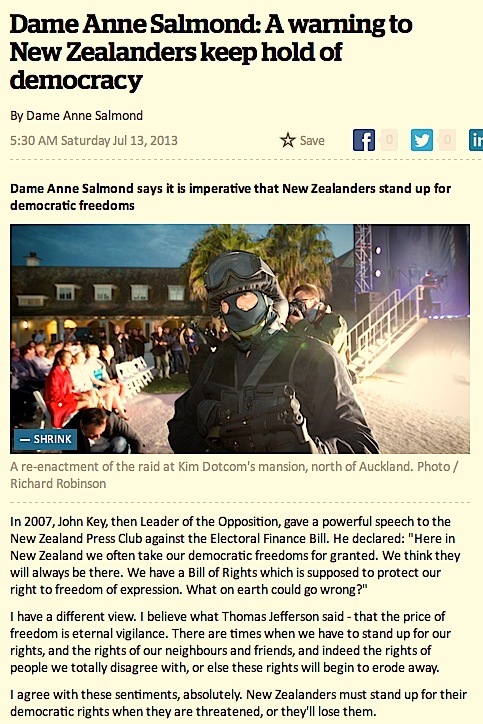 New Zealander of the Year Dame Anne Salmond has used Prime Minister John Key’s own warnings while Leader of the Opposition about ‘threats to democracy’ to condemn his planned law changes empowering the country’s spy agencies. In an essay published by the NZ Herald today, the highly respected author accuses the National Party-led government of enacting laws which are an assault on its citizens’ civil liberties. Who could have imagined that in 2013, this same political leader would be presiding over an assault upon the democratic rights of New Zealanders? This is a matter of such gravity that last month, the Law Society felt impelled to report to the United Nations that in New Zealand “a number of recent legislative measures are fundamentally in conflict with the rule of law”. Extraordinary though it may seem, this statement is no more than the truth. In its report to the United Nations, the Law Society lists a series of recent acts that have allowed the Executive to use regulation to override Parliament, that deny citizens the right to legal representation and cancel their right to appeal to the courts to uphold their rights under the law. The Law Society also draws attention to the use of Supplementary Order Papers and urgency to avoid proper Parliamentary scrutiny of legislation. They express their concern that a number of bills formally declared by the Attorney-General to be in breach of the Bill of Rights have recently been enacted. This report does not mention other key defects in the law-making process in New Zealand at present. These include the willingness of a minority government to pass laws that impinge on the rights and wellbeing of New Zealanders at the request of foreign corporations – Warner Brothers, for instance, or SkyCity and various oil companies. None of these deals, which amount to “legislation for sale”, can claim a democratic mandate. I wonder if all the criticism of his planned spying-on-New-Zealanders laws, and the disquiet expressed by ‘establishment’ and watchdog-types like The NZ Law Society, The Privacy Commissioner, The Human Rights Commission, as well as media, tech & internet groups, and other notable Kiwis will penetrate John Key’s defensive bubble. 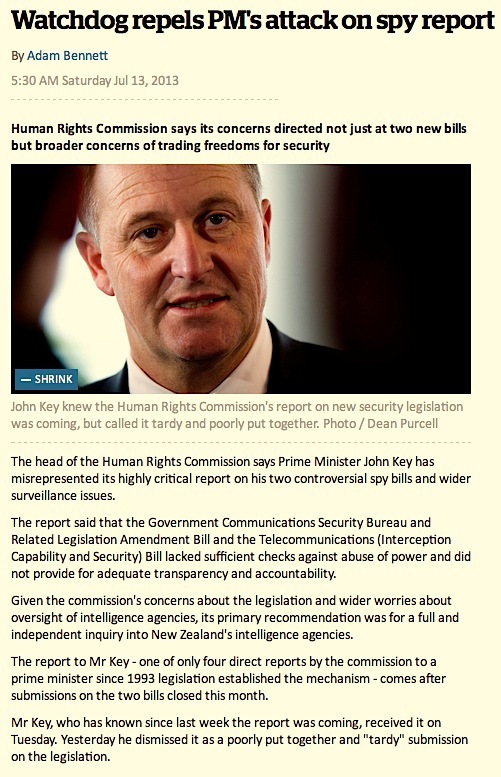 That seems doubtful at present, given Mr Key’s ill-tempered ‘misrepresentation’ yesterday of the Human Rights Commission’s special direct report to the government about its concerns about wider surveillance/privacy issues as a ‘tardy’ committee submission that ‘missed the deadline’. It later emerged he’d apparently been expecting it for days. 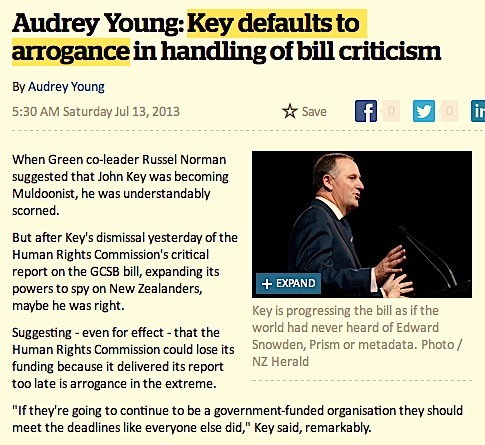 Under pressure, Mr Key is indeed looking more and more autocratic. Ask yourself: Is John Key now coming to resemble a Muldoon-esque figure rather than ‘Barbecue John’, man-of-the-people — notwithstanding his apparent openness to tweaking the proposed legislation in an effort to reach his one vote ‘majority’. Mr Key appears dead-set against the proper independent inquiry into the shadowy fiefdom of NZ’s ‘dubious’ intelligence agencies being widely called for. It’s not a matter of ‘childish’ or Opposition politics, and he can’t credibly continue to try to portray it as such. The GCSB bill currently before Parliament, however, trumps all other recent breaches of democratic freedoms in New Zealand. The GCSB, an intelligence agency that was established to protect New Zealand citizens from external threats, is surrounded by scandal, including an improper process leading to the appointment of its director, an inglorious saga surrounding the arrest of Kim Dotcom and associates, and accusations that the agency has been illegally spying on New Zealanders. … The GCSB bill would give the agency sweeping powers, with the only effective controls in the hands of politicians. The fact that the bill is being dealt with under urgency raises further suspicions about its purposes and intentions. Given the recent record of legislative attacks on human rights in this country, very few New Zealanders could be confident that such powers, if granted, would not be abused for partisan political purposes. Yeah, that’s what I was afraid of. So it’s not just me feeling unsettled (as I was when Mr Key called the police to his Beehive office about the ‘tea-pot’ tapes, resulting in police appearing in newsrooms with search warrants in hand and issuing ‘warnings’ to the media like this: A shot across the news media’s bows re cup of tea tape). It’s time for John Key’s government to stop their charade of ‘consultation’ while scrambling for a (cough) parliamentary ‘mandate’ to pass these spying laws under urgency. The cries of alarm seem too loud to safely ignore. The National Party has a proud tradition of supporting individual freedoms, and for many years — partly as a result of that it seems to me — it has been seen as the establishment’s ‘natural party of government’. It’s time for their current leader to pay more than lip-service to protecting and defending our democratic freedoms. That is what Dame Anne Salmond and others seem to be saying. But is anyone in the Beehive listening? Key’s oversight of the bill does not give one confidence in his oversight of the spy agency itself. He has not convincingly tried to get cross-party support from New Zealand First leader Winston Peters or Labour leader David Shearer. The decision to hold hearings in public was a good one. But the three concessions mooted so far have been half-hearted: a panel of two for the Inspector General to use as a sounding board, adding a set of principles that might include having regard to the Bill of Rights Act; and a review in both 18 months then every five years. He has said he would only consider the review as a way of getting Labour on board. The Human Rights Commission wants much stronger oversight and also wants a full and independent inquiry, echoing Labour and the Greens. The HRC report may have been wiser to omit the inquiry and appear less political. 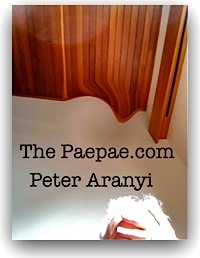 But it is a commission that cannot be dismissed as a creature of Labour – quite the opposite. Almost all the commissioners, including Chief Commissioner David Rutherford, were appointed by the National Government and signed off by National’s Cabinet honours and appointments committee. The Human Rights Commission was hailed by Key in opposition when it highlighted appalling weaknesses in the proposed electoral finance legislation. It deserves greater respect than Key gave it yesterday.